An artist's illustration of t/Space's CXV spacecraft approaching the International Space Station (ISS). NASA has agreed to help support a pair ofprivatespaceflight companies as they develop competing designs for vehicles thatcould one day ferry astronauts andcargo into orbit. The U.S.space agency signed Space Act agreements with Chicago-based PlanetSpaceInc. and Reston, Virginia's TransformationalSpace Corp. (t/Space), and will provide the two firms with requirements andspecifications for crew and cargo flights to the International SpaceStation (ISS). Unlike NASA'sCommercialOrbital Transportation System (COTS) competition, the Space Act agreementsinclude no funding support, though the space agency will recognize each firm'sprogress during vehicle development. "It allowsus to go ahead and meet specific milestones and goals to reach our orbitalcapabilities," PlanetSpace chairman Chirinjeev Kathurian told SPACE.com,adding that the NASA agreement allows the firm to focus its efforts. PlanetSpace'splanned orbital spacecraft, the Silver Dart,is derived from the U.S. Air Force's Flight Dynamics Laboratory-7 (FDL-7)experimental aircraft and designed to launch atop a NOVA booster based onRussia's Soyuz rocket [image].The vehicle could be fitted with docking hardware, cargo modules or crewcompartments based on their flight plan, PlanetSpace officials said, addingthat the first demonstration launch is targeted for December 2009 [image]. "I think itwill be probably be unmanned," Kathurian said of the first Silver Dart flight,adding that crewed launches could follow in 2010 and 2011.
t/Space,meanwhile, is designing an air-launchedspacecraft system for both crew and cargo trips to the ISS [image].The firm was one of sixfinalists for NASA's COTS competition to develop new launchers andspacecraft for ISS-bound flights before the space agency split that $500million purse between private spaceflight firms SpaceExploration Technologies and Rocketplane Kistler in August 2006 [image]. "It'simportant that investors and potential stakeholders see that NASA valuest/Space as a potential supplier to the International Space Station," t/Spacepresident David Gump told SPACE.com of the new agreement. "We expect tobe able to do a crewed orbital flight by the close of 2010." Alan Lindenmoyer,manager of NASA's Commercial Crew and Cargo Program Office at the Johnson SpaceCenter, said NASA's goal is to help facilitate access to low-Earth orbit. Thenew Space Act agreements address just two of the some 21 proposals NASA receivedfrom private firms during the COTS competition. "There weresome excellent ideas there," Lindenmoyer said in a telephone interview. "It'sjust that we didn't have enough money to fund all those studies." NASA plansto hold a second open competition around 2010 to determine whether to chooseservice contracts with private firms to supply the ISS. 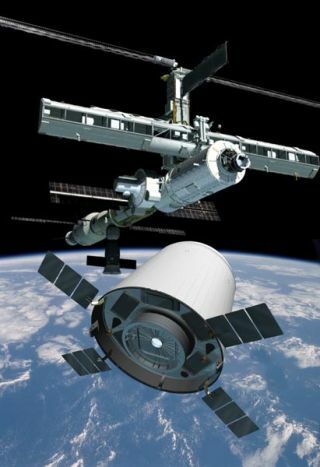 The space agency'scurrent transport system to the ISS - NASA's three remaining space shuttles - is slated for retirementin September 2010 once assembly of the space station is complete. "I think it'sreally good to see that these companies are still in the game," Lindenmoyersaid.